Thorek/Scott and Partners congratulates Equitable Bank on being selected as one of Canada’s Top Small & Medium Employers for 2015. A longstanding partner in support of Equitable Bank’s growth, Thorek/Scott and Partners’ is very proud of this outstanding achievement. 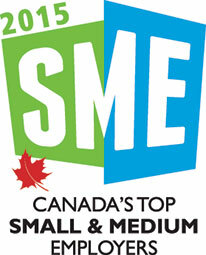 Now entering its 3rd year, Canada's Top Small & Medium Employers is an editorial competition that recognizes the small and medium enterprises (SMEs) that offer the nation's best workplaces and forward-thinking human resources policies. Equitable Bank was selected in large part for their unique culture, competitive benefits and savings programs, open senior leadership team and continued employment growth. They truly are a “Top Employer”. All 2015 winners were announced in a special magazine published in The Globe and Mail on March 10, 2015.